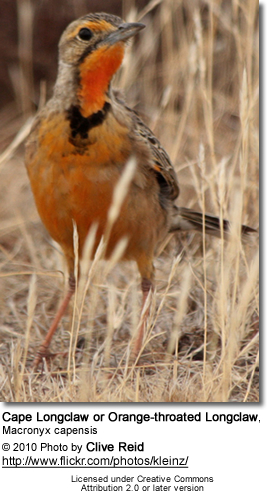 The Cape Longclaw (Macronyx capensis - also known as Orange-throated Longclaw - is native to Southern Africa, where it occurs in Zimbabwe and southern and eastern South Africa. It inhabits coastal and mountain grassland, often near water. This species has been named for its unusually long hind claws, which are thought to help in walking on grass. They are usually seen in pairs. The Cape Longclaw measures 19 - 20 cm in length. The adult male has a grey head with a buff supercilium ("eyebrow") and a streaked blackish back. He has a bright orange gorget (= a broad patch of metallic-looking iridescent feathers on the throats), black chest band and otherwise yellow underparts. The female has a duller plumage. She has a yellow throat and much weaker breast band. The juvenile can be identified by its dirty yellow throat, indistinct breast band, and yellowish white underparts. They resemble the unrelated meadowlarks - grassland birds of the Americas. Its song is described as a musical cheewit cheewit. Its contact call as tsweet, and its alarm call as mewling. Cape Longclaws are ground nesters. A clutch consists of up to four speckled eggs. They mostly feed on insects picked off the ground. They also take some seeds.